We must be cautious not to propose the use of law and state force to deal with social issues that require structural implements such as increased investment and the rebuilding of trust within and between members of the broader community. The unresolved and simmering presence of violence and protest on the Cape Flats continues to be a complex point of discussion. Recently, Cape Town has witnessed a resurgence of the call for the deployment of the South African National Defence Force (SANDF) to combat the elevated levels of violence on the Cape Flats. This call is not without its own controversies, and as a class of LLB students we believe the issue needs to be unpacked carefully. Even though we are students at UCT, six of us (including our lecturer) come from various areas on the Cape Flats. Some of us still live in Mitchell’s Plain and similar areas. Our analysis is based on our own experiences and those of the people who live around us. Race has, in part, been at the centre of many of the recent protests on the Cape Flats. 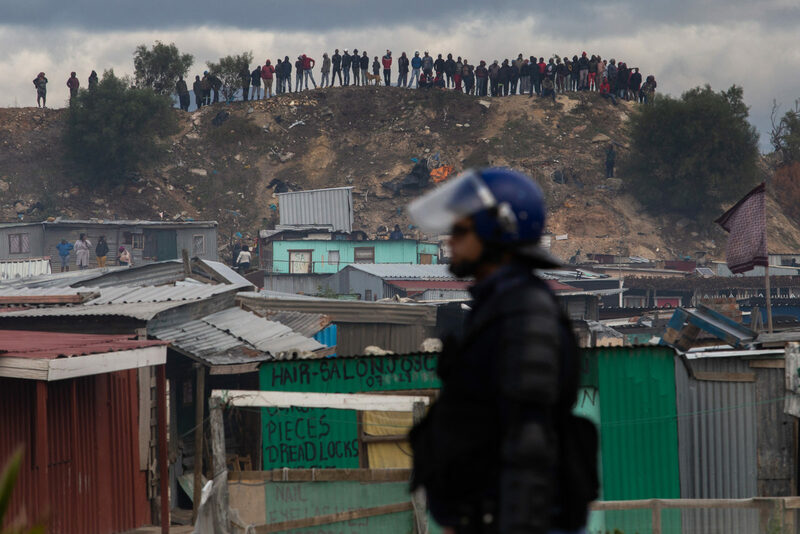 Earlier this year, protesters at the Siqalo informal settlement, many of whom recently moved from the Eastern Cape and are predominantly African, protested in Mitchells Plain, a predominantly so-called ‘Coloured’ community. The protesters were demanding access to basic services like water, electricity and sanitation from the City of Cape Town. The complexity of this protest was enhanced by the clear class dynamics at play. Many of the pre-existing Mitchells Plain residents are second or third generation families with some access to established bulk infrastructure – running water and electricity. Albeit a poor community overall, there are clear differences in existing access to resources. The obvious potential pitfall became clear when their interests diverged. As soon as the protesters blocked the arterial routes into the area and set alight private property, the residents of Mitchells Plain responded with aggression. The often vitriolic communications from the group calling itself the “Gatvol Capetonians” capture these sentiments, although they do not speak for all residents. This interplay was the result of a festering conflict between the two areas (and the City of Cape Town), that dates back to at least 2013 (8 March 2014, IOL news). As South Africans, we all live with the ever-present awareness of the ways that race has shaped how we engage with one another at the train station, at work, at university, in shops. It permeates every aspect of our existence. Some people are obviously more affected by this than others because of how they are positioned in society. What most people care about is having a home, family, friends, a job or a good school. In this way, none of us are any different. The Apartheid policies and legislation stratified society physically, socially and economically. The Group Areas Act of 1950 segregated people of different racial groups by removing people of colour from areas reserved for white people and placing them in areas reserved for respective race groups. Unfortunately, in post-apartheid South Africa, privilege and economic stability continues to be plagued by racial classification. Apartheid-assigned areas are still predominantly inhabited along those same racialised patterns. Some of these areas are separated by something as small as a road, such as Jakes Gerwel Drive, which is all that physically separates the residents of Mitchell’s Plain and Siqalo. This road acts as an extreme point of transition along race and class lines between two obviously different communities. The Apartheid spatial planning and unequal distribution of public resources remain entrenched making the structural history of Cape Town the clear underlying cause of conflict. Thus, what on the face of it is appears to be racial tension is really a fight to the bottom between two struggling communities in competition over scarce resources (4 May 2018, Daily Voice). The localised tension between these two communities has in many ways been re-catalysed by a number of incidents of racism nationally. Recent examples include the woman who used the k-word on the plane (17 June 2016, News24), Julius Malema’s speech saying that most Indian people are racist (25 June 2016 City Press), and some of the national conversations, mainly over social media, about the racism in “coloured” communities and notions that “coloured” people were more privileged under apartheid. Cape Town is particularly singled out for this with the largest coloured population in a metropolitan city. Although Mitchell’s Plain residents have indicated that their conflict with the Siqalo residents, hinges upon the tactics used by the protesters, some of the language used by some residents appears to be about protecting the rights of coloured’ residents, rather than African residents from Siqalo. Many coloured people have expressed a feeling of being abandoned or ignored by both the apartheid government as well as the government in the democratic dispensation (Kirk Krotz I love and hate Mitchell’s Plain). Several social movements have tried to re-assert a positive self-identity for a community that is often portrayed as struggling to define what it means to be “coloured”. A number of these movements are making headway in the fight against stereotypes and in the promotion of a sense of belonging and achievement (for example, Heal the Hood and Mixed Mense). Conversations about identity are important, as we as South Africans – even those of us who were born after 1994 – are struggling to forge a united country. A critical consideration is, however, the role of violence in the context of desperation and protest. In the case of the Siqalo residents, the MEC for Human Settlements and leader of the Democratic Alliance in the Western Cape, Bonginkosi Madikizela, has explained that the city is currently looking to identify 52 hectares of land for the relocation of 1,000 Siqalo residents. Members of both areas have since engaged in crisis meetings to mitigate the conflict between the two groups. These conversations must continue so that we do not get stuck at the racial analysis. We must move on to finding solutions to our resource problems of housing, health, sanitation, education and crime. The DA (Democratic Alliance) recently organised a march from Mitchell’s Plain to Nyanga, calling for the deployment of the army to be brought into gang-ridden areas, many of which are on the Cape Flats. This is a potentially incendiary move. The presence of the military can in many cases exacerbate violence and encourage the militarisation of indigent communities (Violence Against Civilians in Civil Wars: Looting or Terror? Journal of Peace Research).